Storm Leaves Veteran Couple without their Home, Volunteers Help. Tri-County Community Action Program, Inc. RSVP and New Hampshire Department of Homeland Security and Emergency Management Continue to Positively Impact Lives After Devastating October Storm. Coös County Retired Senior Volunteer Program (RSVP) Program Manager Nancy Malone of Tri-County Community Action Program, Inc assisted Pam Borne-Levandowski and Randy Levandowski after the October storm destroyed their home. “Nancy, with her heart of gold and passion to help everyone, has made a truly impactful difference in the lives of this couple. Their lives were devastated by the storm at the end of October, when they lost everything, including their home,” states Andrea Brochu, TCCAP Division Director. 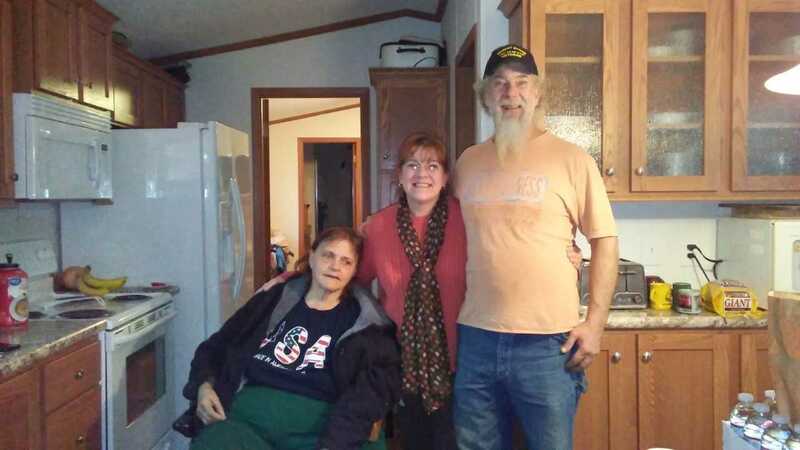 Nancy and TCCAP’s Senior Corps RSVP Volunteers had come together to ensure that this couple; both combat war veterans and one an amputee, had a roof over their head, food in their cupboards, and clothes on their backs. Nancy was able to secure donations and collaborations with the State of NH Department of Homeland Security and Emergency Services Disaster Relief, American Red Cross, DAV, DAV Auxiliary, Berlin VFW Post 2520 Auxiliary, Bridge House Veterans Advocacy, Friends and Neighbors Pantry, White Mountain Rotary, Rolling Thunder Veteran Group, and TCCAP.